The answer to this question is pregnant with a lot of Satanic implications that are – as we shall show to be obvious reasons – either deliberately ignored by the scholars of Muhammadan Islam or their logic escaped their intellect. Either way, we must – as always – turn our attention to the Muslim sources so as to gather some of the data on what pagans, and even Muslims, saw as signs associated with satanic activity. The Islamic literature provide criteria to know whether a person is possessed and/or whether that individual is a sorcerer. We shall then use these criteria to see whether or not Muhammad falls within the category of a person possessed and/or of a sorcerer. ‘Then what are we to say, O Abu ‘Abdu Shams?’ they asked. He replied…. The nearest thing to the truth is your saying that he is a sorcerer, who has brought a message by which he separates a man from his father, or from his brother, or from his wife, or from his family. The above Hadith is remarkable because it shows that even 1400 years ago, among the most ignorant and uneducated people, there were some who realized the enormity of the future consequences of following Muhammad’s dictates. That Muhammad’s message was and is so evil and demonic that it pitted men against women, sons against fathers, brothers and sisters against each other, wives against husbands and utterly destroyed family and tribal loyalties, manifests itself even after the lapse of 1400 among his modern followers. This is exactly what Satan’s message and purpose for humanity would have been. (Sahih Al-Bukhari, 9. 111) Narrated ‘Aisha: The commencement of the Divine Inspiration to Allah’s Apostle was in the form of good righteous (true) dreams in his sleep. … The angel came to him in it and asked him to read. The Prophet replied, “I do not know how to read.” (The Prophet added), “The angel caught me (forcefully) and pressed me so hard that I could not bear it anymore. He then released me and again asked me to read, and I replied, “I do not know how to read,” whereupon he caught me again and pressed me a second time till I could not bear it anymore. Then Allah’s Apostle returned with the Inspiration, his neck muscles twitching with terror till he entered upon Khadija and said, “Cover me! Cover me!” They covered him till his fear was over and then he said, “O Khadija, what is wrong with me?” Then he told her everything that had happened and said, “I fear that something may happen to me.” …. and the Divine Inspiration was also paused for a while and the Prophet became so sad as we have heard that he intended several times to throw himself from the tops of high mountains and every time he went up the top of a mountain in order to throw himself down, Gabriel would appear before him and say, “O Muhammad! You are indeed Allah’s Apostle in truth” whereupon his heart would become quiet and he would calm down and would return home. And whenever the period of the coming of the inspiration used to become long, he would do as before, but when he used to reach the top of a mountain, Gabriel would appear before him and say to him what he had said before. Believers and Unbelievers, the above hadith shows that, contrary to what Aisha said, these dreams were extremely bad! Choking, gasping, spasmodic movements, delirium, and whispering. Muhammad manifested almost all the signs of one who was possessed, since he often had spasmodic body movements, and major changes in physical demeanor. He was also seen to be moving his lips, due to the so-called revelation being impressed upon his heart which he tried to then memorize. After skimming through the Muslim data, we can now make some closing observations. Muhammad’s religious experiences and practices mirror all of the criteria establishing possession and sorcery. Did Muhammad experience some form of choking, gasping, spasmodic movements, delirium and whispering when the so-called revelations came to him? Yes. Did Muhammad use spitting and blowing? Yes. Did Muhammad claim eloquence, boasting to be the master of eloquent speech? Yes. Were Muhammad’s dreams frightening and terrifying? Yes. Did these dreams cause Muhammad to fear that he was possessed whereby he even contemplated suicide? Yes. Did the revelations sound as the ringing of bells? Yes. 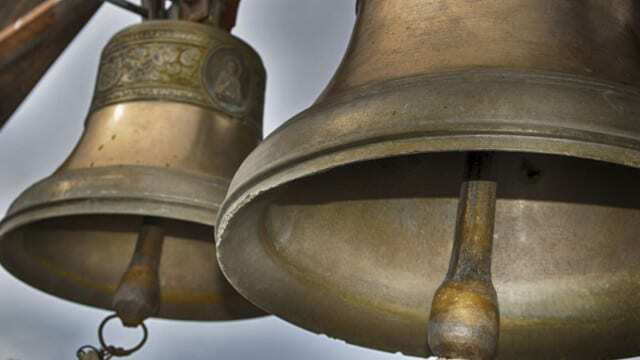 Did Muhammad and others, associate bells with Satan? Yes. The Hadith literature ends up confirming the suspicions of the unbelievers since it plainly states, that Muhammad was indeed bewitched and even believed that he was possessed. Hence, the evidence leads us to the inescapable conclusion that Muhammad was not a prophet like the true prophets of the Bible. Instead, he manifested all the signs of a possessed sorcerer. We would like to point out the obvious, that these are the criteria from the MUSLIM sources. These are not criteria culled from the enemies of Muhammad. Muhammad meets many, if not all, of the criteria of being under demonic influences that are confirmed by the Islamic source texts. Since all the verses from his Quran and Hadiths assert that Muhammad truly believed and continually asserted that the Ringing of Bells are from Satan, then he is clearly indicating in the above Hadith that the “Hardest of all his revelations are associated with the ringing of bells” proving for all that his ‘revelations’ were NOT from Gabriel but from Satan pretending to be Gabriel hence fully explaining the characteristics of his Quran and his cloned followers manifesting incredible and obscene degrees of: Hate mongering; Warmongering; Racism; Duplicity; Hypocrisy; Intolerance; Treachery; Deception; Plundering; Enslavement; Debauchery; Vileness; cruelty and Un-Godliness. In conclusion, every letter, word, aya/ verse and sura/ chapter in the Quran are the sole product of Muhammad’s own imagination; the secretions of his warped mind, but very cleverly projected into the unsuspecting mouths of Allah and Gabriel to give them the aura of sanctity and divinity and $200,000 says no one can invalidate this. As always, we prove beyond a shadow or even a reasonable doubt that the Demonic and Disgusting qualities of Muhammad, his Quran and his followers are not based on conjecture, prejudice or malice but are rooted entirely upon the Arabic and Islamic sources.